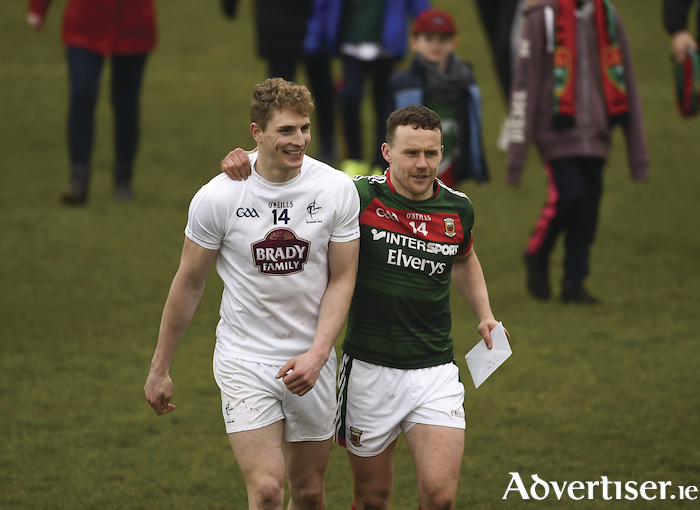 That was fun: Kildare's Daniel Flynn and Mayo's Andy Moran have a chat leaving the field in Newbridge last Sunday. Photo: Sportsfile. Mayo played out their round five league clash against Kildare in glorious conditions last Sunday in Newbridge, and no question about it, Mayo put in their best performance of 2018 and eased their relegation worries — running up a fine tally of 1-19 and in the process all but condemning Kildare to division two for next season. This was a much improved performance from anything we have seen in the eight games that Mayo have played so far this year, there will of course be the pessimistic out there who will struggle to compliment Mayo for a fine performance and point out that Kildare were truly terrible and kicked an awful lot of wides. But the bottom line about this game was that it was an extremely important game for both sides and Mayo were the team that delivered on the day, and Kildare did not. You know it is a good sign of a team performance when you speak to people after the game and four or five different players get mentioned as potential man of the match winners, as was the case last Sunday. Mayo notched up an impressive 1-13 from play and it could have been much more, had Mark Donnellan not pulled off two very fine saves from Cillian O'Connor and Lee Keegan in the second half, the save from the Ballintubber man was particularly impressive. Both teams had their periods of dominance, Mayo came out of the blocks in style with Andy Moran showing some of his player of the year skill set, his first score was a sublime effort after some great tracking back by TG4's man of the match Kevin McLoughlin. Robbie Hennelly was called into action in the 14th minute, he executed a brilliant point blank save from Kildare's centre forward Niall Kelly. There were many fine team scores but for me the best came in the 19th minute. Aidan O'Shea won a hop ball on his own 14 metre line, before bursting forward and in a superb piece of team play that involved Lee Keegan, Jason Doherty, Andy Moran, and Diarmuid O'Connor before O'Connor took a return hand pass from Adam Gallagher to tap over with his left foot. It was top drawer, the kind of score the Harlem Globetrotters would have been proud of. It was then Kildare's turn for their period of dominance, the most worrying part of which was the ease at which Daniel Flynn worked his way from the Mayo end line all the way across the 14 yard line before finishing past Robbie Hennelly without a single hand being laid on him to put the Lillywhites ahead. Credit to Mayo though, they responded in kind and scored 1-4 on the spin before half time to go in five points to the good. Cillian O'Connor showing his nerve and class with a huge point from about 47 metres out, not long after missing a fairly straightforward free. Any time is a good time to get a goal but just before half time is demoralising for your opponents. Again Mayo's experienced brigade took centre stage, Jason Doherty, Andy Moran, and Lee Keegan combined to knife their way through the Kildare rearguard setting up Aidan O'Shea to palm the ball to the net. Palmed goals are now a very common occurrence in games. Had O'Shea caught the ball and tried to get a shot off he more than likely would have been engulfed and turned the ball over. It was improvisation of the highest order. The second half was all about concentration and not letting Kildare within touching distance. Four points was the closest they got at any stage. Some of the Mayo forward play was exciting and encouraging to say the least. A 10 point second half haul a fine return for what was a very commendable performance. It was great to see Diarmuid O'Connor back to getting on plenty of ball and using it wisely, he covered some amount of ground. Tom Parsons got a very beneficial 46 minutes under his belt which should see him able for even more next weekend, Jason Doherty and Andy Moran too put in big shifts but the two stand out players were Aidan O'Shea and Kevin McLoughlin. Both played brilliantly and if I was put on the spot I would struggle to choose between them for the man of the match award. It is a nice feeling to be able to rate all your forward line with at least a seven out of 10. They all scored from play too which is a healthy sign. The same will be needed again this weekend as Tyrone come to town in what is a winner takes all game. Tyrone also put in their best performance of the year last weekend against a Paddy McBrearty-less Donegal. Mayo have not played well in the league in Elverys MacHale Park so far this season, losing both games against Kerry and Dublin. They will want to give the home crowd something back for the tremendous support they give them. For that reason Mayo should come out on top. I was in Croke Park last Sunday to watch Dublin annihilate Kerry. We will soon run out of superlatives to describe Dublin, however, Kerry caused them untold damage in the first 20 minutes. It was the first time I witnessed Cian O'Sullivan taking a roasting as David Clifford tore him asunder in that period. If you have any chance of beating Dublin you have to take your chances. Kerry had two tap ins and failed to take either during their period of dominance. As I watched Paul Geaney and Sean O'Shea limp off at half time I knew Kerry's chances had gone up in smoke. Dublin blitzed them in the third quarter as Dublin normally do.